If London Fashion Week has inspired you to refresh your wardrobe ready for the colder months, check out our edit of the season’s 7 most wearable trends – and raise donations for your good cause too. Autumn/Winter 2018 is shaping up to be an eclectic mix of classic British-with-a-twist going head-to-head with retro 80’s chic (think neon and pixie boots) – plus layering, and lots of it. The only problem you’ll have is deciding which look to rock first! It was less catwalk, more savanna at many of the designer shows this month, with cheetah, crocodile, zebra and snake prints being seen alongside the more ubiquitous leopard. 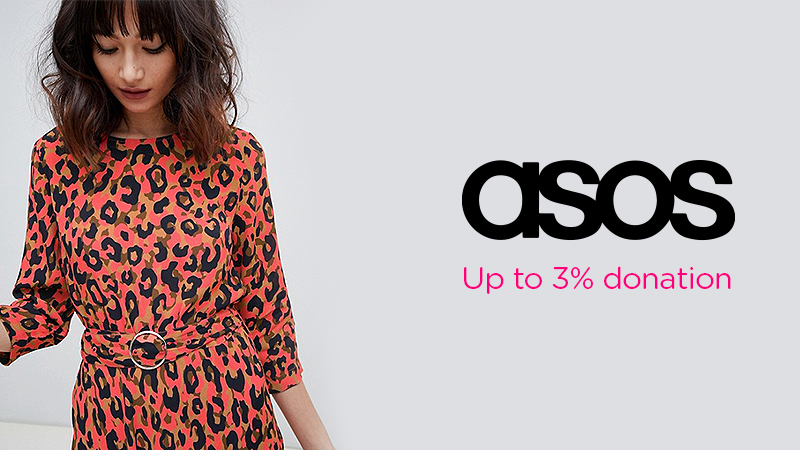 Inject some fierce into your wardrobe with a shift dress or fitted jacket from ASOS (up to a 3% donation) or Very (up to a 3.5% donation). If you favour a more minimalist look, accessorize with a modish cross-body bag from Radley (up to a 2.5% donation) or a timeless silk scarf from Liberty (up to a 3% donation). Browns are big, but it’s essential to mix up your textures to avoid an overall impression of sludge. Try teaming a glossy chestnut brown leather coat from AllSaints (up to a 5% donation) with a tan satin top from Harvey Nichols (up to a 3% donation) and a pair of matt tweed trousers from The Edinburgh Woollen Mill (up to a 2.5% donation). Fruity neons are also set to be huge – so to really stand out from the crowd, add a pop of orange, lemon or lime to a simple black or navy ensemble. Click through to Topshop (up to a 3% donation) for brilliant brights of all varieties. Once frowned upon as frumpy, the humble cardigan has undergone something of a renaissance of late. 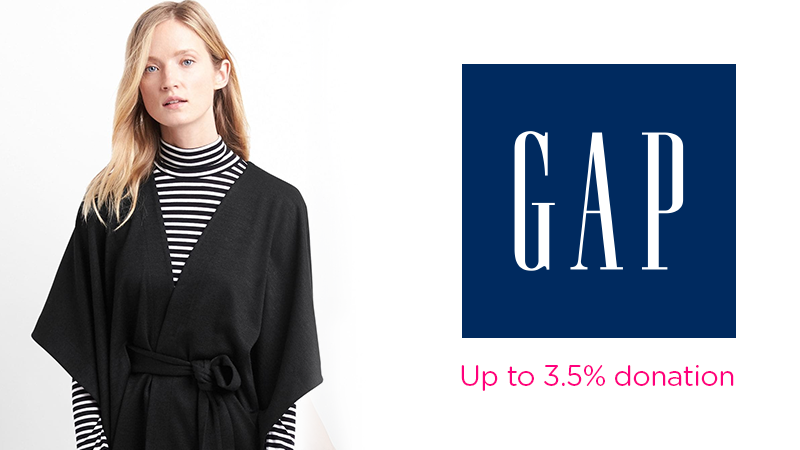 Slouchy grandad styles can replace a coat on warmer days, with Gap (up to a 3.5% donation) being your go-to for good quality knits to flatter all figures. For a sleeker silhouette, add a wide leather belt from John Lewis & Partners (up to a 1.5% donation). Oversized blanket wraps are also very much en-vogue and are just perfect for those frosty early morning commutes. Source yours at Monsoon (up to a 5% donation), add a quirky brooch from Etsy (up to a 4% donation) and you’re good to go. Winter party season is just around the corner, and this year, evening wear is all about luminous, light-catching fabrics. Glow in a silver or bronze lurex bandage dress from TopShop (up to a 3% donation) or shimmer in a colourful sequined dress from Boohoo.com (up to a 2% donation). Synonymous with crisp autumn days, these fab fabrics are ideal for the colder weather. Whether you like to step out in a belted trench, a smock dress or a sharp business suit, indulge your inner Kate Middleton at Wallis (up to a 2.5% donation), Missguided (up to a 3% donation) or Joules (up to a 2.5% donation). This season’s length falls somewhere between a midi and a maxi – essentially, you’re aiming for just above the ankle. La Redoute (up to a 5% donation) do a nice line in pleated designs or visit Whistles (up to a 3% donation) for a luxe leather A-line. Another major trend is the slashed ribbon skirt – these look absolutely amazing when paired with an oversized sweater and ankle boots – H&M have a wide range available (up to a 3% donation). You probably haven’t stepped out in a slouchy boot in recent years, and you may be surprised at just how flattering they are, especially when teamed with a pair of skinny jeans. Swing by Schuh (up to a 3% donation) or Clarks (up to a 2.5% donation) for the perfect pair. In terms of shoes, it’s all about the heel. Anything from architectural blocks to sleek kitten heels goes this season, with reds and silvers dominating in terms of colour. Head over to Office (up to a 3.5% donation) to treat your feet.